Recorded live in concert at the Philharmonie in Berlin in April 1999 this performance of the Goldberg Variations contrasts profoundly with that by Jean Louis Steuerman, recorded two years later in London, which I�ve also recently reviewed. It�s not just a question of repeats that means that Craig Sheppard takes less than forty minutes and Steuermann more than seventy-three. The difference between them goes beyond mere temporal considerations, significant though these can be. But whilst Steuerman�s sometimes notable pianism is put to the service of an intensely meditative, frequently static, muse, Sheppard, with no loss of depth, invests the Variations with colour and animation, freshness and vitality. The two approaches are musically oppositional and whilst Sheppard isn�t invariably convincing in all he does his is the performance that comes closer to the core of the music, that responds more appropriately to its reflection and dance, which discovers more fruitfully its seriousness without becoming sententious. It�s also an approach I found intensely sympathetic and likeable. If Sheppard has a fault it is an overuse of the stabbing staccato, and he serves notice in the course of an otherwise affectionate and beautiful statement of the Aria that the left hand�s animating propensities will be thus used. The first variation is full of tonal gradation however and infectious and I delighted in the animation, the brio and drive of the Fourth. The excellence of the Fifth is followed by a rather staccato sixth � the air of deliberation and stuttering progress is a disappointment though this is clearly a thoroughly thought-through interpretation. It sounds directionless to me. The second canon likewise never quite comes to life whereas the fourth canon is a thoroughly convincing and beautifully played affair. In the Thirteenth Sheppard is full of decorative and rococo charm though ones that gather in strength but I was less convinced by the succeeding fourteenth. In his inspiring review of a Quintet of Goldberg recordings recently, colleague Christopher Howell refers to Sheppard�s playing of this variation as "messy" and here, as so often elsewhere, I find myself echoing him. In the Fifteenth variation I found Sheppard�s noble dignity rather too heavy but I greatly admired the subtle rhythmic bite with which he vests the Eighteenth. Freshness and animation, prime Sheppardian constituents, drive through 20 and a thrilling wit and clarity radiates from 23 as he relishes the hands� discourse and brings out the left hand lines. The Twenty-fifth is the so-called Black Pearl and Sheppard is suitably intense and but at a relatively flowing tempo. From here in Sheppard�s tonal beauty makes its mark � number 26 is especially rounded tonally. I very much share Christopher Howell�s reservations concerning variation 29 however. On record and in concert Angela Hewitt, for one, has shown how intensification does not necessarily mean over aggressive playing of this kind. When however the Aria da capo is heard it is with a proper sense of visionary return. A Washington performance of the Fifth Partita is included. It�s somewhat afflicted with mechanical bumps in the sound and the central Sarabande is very slow and whilst of almost evasive delicacy might well sound etiolated to less sympathetic ears. I admired the clarity of voicings and the vivacity of the Gigue. 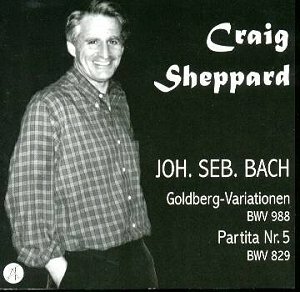 But the Goldberg Variations is the focus of interest and I would certainly recommend Sheppard. He has tonal resources that are at the service of the music and never deployed for narcissistic effect; his is a Goldberg, as I suggested earlier, of colour and animation and it�s one to which I know I shall return.